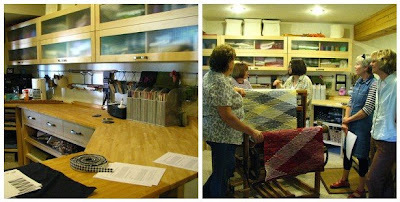 Linda Kennedy of Elk Run Handwovens, has graciously invited our group of weavers out to see her wonderful studio and give us an idea how to start a diamond rag rug. 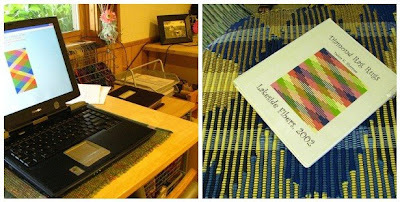 Her and Elin have both taken a class from Deb Sharpe at Sievers and Lakeside Fibers in Madison. Linda has a computer program called RugDsign that makes the design and math not quite so daunting. It is available for free download here. 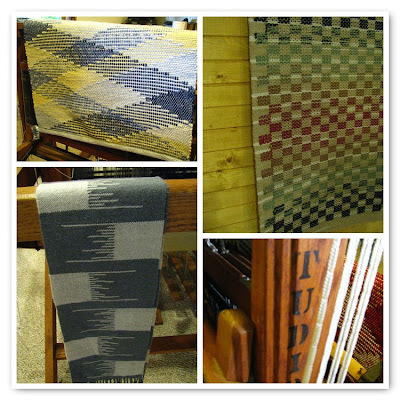 It was hard for me to focus because there were so many lovely finished handwovens to photograph. 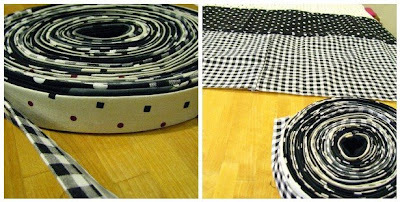 Elin brought a couple of her rugs, Susan had recently finished a pillow that totally matched one of Lindas rugs and her sweet bee sack. Go here to see more of Susans weavings. Denise had 2 incredible shrugs she had spun and woven. I had brought some dichroic glass buttons for Linda to pick out and of course forgot to photograph them but will soon. Other pics of our fun day can be seen here. Linda was a great hostess and had the most beautiful tarts; one was gone before I had a chance to photograph it, but yea there were two. Yum. Talented weaver, great hostess and an inspiring friend. And now that we know how to find her place (challenging) I’m thinking that we need to come back. This technique looks very exciting, and the carpets are beautiful. I wonder how they get the diagonals? Boy, am I disappointed that I missed this day! Driving 15 1/2 hours from Buffalo, NY on Monday just can't match it. Wish I had been there.